Do you have format errors with Strontium USB BOLD 4GB .Download Strontium USB BOLD 4GB format tool and fix your corrupted flash disk .We will use URescue v1.2.12.4 to update Strontium USB BOLD 4GB firmware . Strontium USB Stick BOLD 4GB format tool is designed to repair and format Strontium Flash drives 4GB and also remove write protection errors.The format software used here is URescue v1.2.12.4 utility .Strontium format tool will revive and upgrade the 4GB BOLD USB flash drive with BID Solution .Strontium flash drive recovery tool will update your Strontium 4GB usb Firmware and repair all format errors with it . Download Strontium recovery tool from the download links in the end of this article . Insert your corrupted Strontium USB pen drive to your computer . 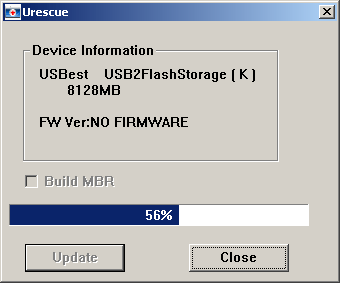 If you can take backup of your flash drive files do it , Warning all data will be erased during firmware upgrading process . Open URescue v1.2.12.4 format tool ,you will see Strontium 4 GB information appears on the software interface . To begin firmware update , please click Update . Don't interrupt USB flash disk during formatting process . If this software doesn't work with your flash drive ,go to the second solution "remove the case of the flash drive and write in a comment the details that exist on the chip controller of flash drive board and i will try to find the best firmware for you .